About 25 years ago, when I used to work for The Indian Express, the newspaper had a tagline – ‘Because the truth involves us all’. Those were the days when Arun Shourie, the paper’s firebrand editor and his boss, the irrepressible Ramnath Goenka, were taking on the then Government on the Bofors scandal exposing the corruption and rot within. That positioning statement then meant to me, as a young, impressionable journalist, that one had to take on the establishment and bring the truth, with honest reportage, no matter what. Over the years, I have carried this spirit in me, though I have mellowed down, or matured perhaps, to understand and appreciate that while the truth does not need to be advertised, it surely needs to be always, and surely, spoken at the right time, with the right person, at the right place! As long as you know it is the truth, always speak it. Because the truth can and must never be hidden. 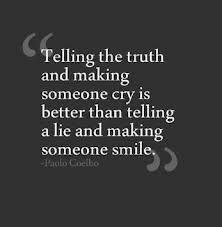 And because the truth involves you! But the most baffling thing about humankind is that we find it very easy to lie, to cover up, to say what immediately comforts us and the listener, than to speak the truth. Having spoken what’s easy, what came easy, the ideal situation must be to not suffer any more. Yet, most of the time, the person who has chosen NOT to speak the truth, grieves and suffers. This is what is most tragic. Let’s say you have a tyrant for a boss. And you wish you could tell him what he was doing was wrong. Instead you keep praising him or approving of all his nonsensical behavior because you feel it is easier to pamper him than provide him with constructive feedback. Now, as long as you are living peacefully having deceived yourself and falsely pumped up the boss’ ego, there will really be no problem. But if you continue to feel miserable because you have been saying what you don’t believe in, then you have a problem. And the only solution then is to speak the truth about your boss, to him! Contrary to most opinions, the truth is always respected. Both by the one saying it and by the one listening to it. But always say it to the one who is directly concerned with the truth. If you don’t, and choose to speak to a third party, you are actually promoting gossip. That’s when you are vitiating the atmosphere. For you, and for the person to whom you intend to speak the truth. Truth does not require any crutches. It can stand on its own. And you too can say it without any fear. But you believe just the opposite is true, in any relationship, because YOU don’t want to be the person saying it. You prefer that someone else bell the cat. Or that a kid, than you, tell that the emperor is wearing no clothes! That’s fantastic. If you are comfortable being someone who continues to thrive while pleasing everyone around, that’s just fine. Then, why are you grieving? Please don’t. If you are grieving over the state of any of your affairs, and if the people connected with your Life, need to be shaken awake, then throw the truth at them. Let them deal with it than you suffer with it! That’s the way to intelligent living. That’s the way to inner peace.